Programming note: in the interest of not bogging down my upcoming review of Halloween (2018) with my thoughts on the decision to reboot the franchise continuity again, here’s an entire editorial on the subject. Stay tuned for more Halloween coverage all week! When David Gordon-Green’s Halloween bows in theaters later this week, fans will face a familiar conundrum: a sequel that sacrifices previous entries by slashing them out of continuity. For longtime fans, it’ll be an especially ruthless bout with déjà vu, what with Halloween H20 taking the same approach two decades ago, a controversial move that inspired fierce message board debates. As a veteran of that heated battle who spilled way too much digital ink in a vain effort to reconcile that film’s continuity bludgeoning, I feel uniquely qualified to declare that it was all quite silly. I spent so much time debating whether or not I didn’t warm up to H20 because of its continuity issues when the truth was much more simple: I didn’t warm up to it because it’s not a very good movie, and I would have been more than happy to let those other issues slide if it had been. As such, I’m heading into the latest reboot with an open mind: at this point, I’m so starved for a decent Halloween movie that I’ve embraced tossing continuity into the wind and allowing the latest sequel to thrive or stumble on its own merits. Not only that, but it’s clear for numerous reasons—the franchise’s strange history and potential future, John Carpenter’s intentions, and common sense—that this is just about the only way Halloween can endure. 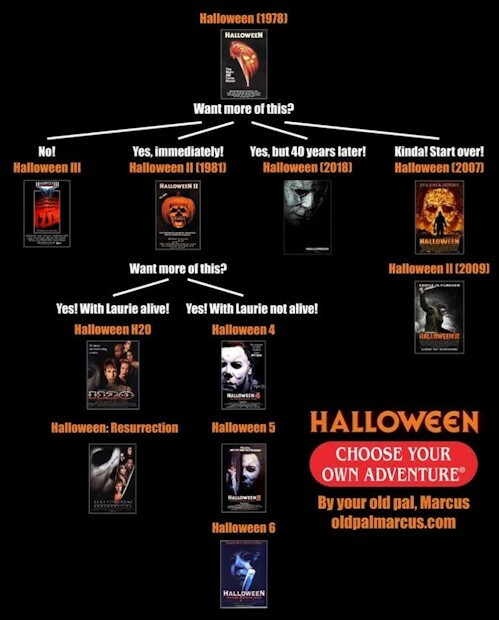 While H20 is the most egregious example of the franchise’s mangled continuity, Carpenter laid the groundwork himself with Halloween III, the infamous standalone entry that has nothing to do with the Michael Myers saga. In fact, Carpenter never imagined he would ever feature in a saga at all and turned to the anthology format to lay The Shape to rest for good. Obviously, it didn’t stick, but it did introduce a wonky sense of continuity that has come to define this franchise: depending on your persuasion, it’s simply baked into the mythos or tags along like excess baggage for the franchise, and the latest entry is simply carrying on the tradition. At this point, it’s a feature—not a bug. Speaking of Carpenter’s intentions (and excess baggage), Halloween 2018 represents a mulligan for the master. By acting as a new, alternate Halloween II, it reverses one of his biggest regrets: desperately turning to a hackneyed sibling angle in the first sequel, an act that effectively explained and demystified Michael’s madness. Infamously inspired by several bottles and cans of booze, this revelation charted the franchise’s immediate path, leading to a convoluted turn of events that’s been retconned multiple times now. What seemed like a decent shock in 1981 soon grew into a more malignant tumor that took the franchise further and further away from Carpenter’s vision of pure, inexplicable evil; no longer was he the phantom of death floating into suburbia but rather a maniac hunting his family, perhaps at the behest at pagan cult. If Carpenter has blessed Danny McBride and Gordon-Green’s decision to eschew all of this, then who am I to argue? “But,” you might retort, “I kind of like those silly sequels!” Friends, I am actually with you here, at least up until Halloween 6. Jamie Lloyd, Rachael Carruthers, cops doing it by the book, goddamn cookie woman, all of the Thorn nonsense, Dr. Loomis’s deranged, decades-long battle with Myers: I’d be lying if I said all of this won’t be lingering about in my brain during the new film, aching like some kind of phantom limb from the purgatory of continuity hell. Here’s the thing, though: all of this has already been erased since H20, and yet, these films have remained comfort food during the Halloween season for those 20 years. Multiple copies rest of my shelf at this point, while Halloween 4 and 5 practically take up residence on AMC during this time of the year. Maybe they don’t technically count, but nobody can erase this trilogy from my heart (we can negotiate about anything involving Josh Hartnett, Busta Rhymes, and Rob Zombie, though). Of course, we longtime fans also need to make a tough acknowledgement: at this point, new Halloween films aren’t explicitly made for us anymore. Yes, making a direct sequel and bringing Jamie Lee Curtis, Carpenter, and even Nick Castle into the fold appeals to nostalgia, but it’s not exclusively our nostalgia. After all, there’s a reason it’s Curtis returning and not, say, Danielle Harris or Paul Rudd (a man can dream, though). As much as we might enjoy the weird, wacky exploits of these sequels, direct follow-ups to them are impractical, if not downright unfeasible. For Halloween to return to box office glory, it has to shed all of that excess baggage once again and take the simplest, most obviously profitable approach possible. Given the year-long buzz surrounding Blumhouse’s upcoming entry, it’s already tough to argue against their decision to reboot: Michael Myers is about to be back in a huge way, something that just wouldn’t have been possible (or at least more difficult) with any other approach.